"The best preparation for college success is practicing with More of The Real Thing." 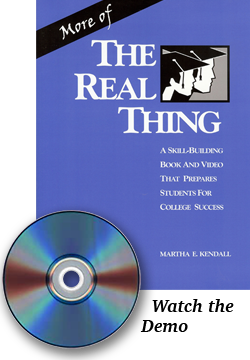 More of The Real Thing is just that - 16 new lectures and an accompanying study skills book that prepares students for college success. Like the highly acclaimed original series The Real Thing, this second set shows authentic teacher/student interaction in mainstream courses. The practical hands-on study skills book uses the lectures to prepare students for what will be expected of them across the curriculum. More of The Real Thing is designed to stand alone or serve as a companion to the original series, giving students a comprehensive overview of American college courses and the skills to succeed in them. Who benefits from More of The Real Thing? How do students use More of The Real Thing? How will More of The Real Thing meet your students' needs? A. More of The Real Thing gives students hours of practice with authentic college lectures. The book guides listeners, emphasizing key point recognition, summarizing skills and test preparation. A. More of The Real Thing teaches students to ask questions, think critically, synthesize ideas and defend opinions, verbally and in writing. A. More of The Real Thing teaches students how to take notes efficiently, and then how to organize, study, and learn from them.